New year on the main Square with "Frajle" and "Valentino"
On the plateau near the monument to the founder of the city King Tvrtko I on the Square, visitors will be entertained by December 31, the group "Frajle" and "Valentino". At midnight, fireworks planned. On the first of January in the same place in the evening the group will perform "Red apple" and "SARS". This part of the city will be decorated with light, and it was planned to set up video link. In the period from 01. 01. 2013 to 30. 10. 2013. The number of nautical vehicles that have stayed in port and used our service is 1411. 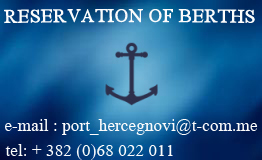 As a preparation for season 2012, diving, electrical and plumbing works were carried out on the infrastructure in preparation for reception of yachts and tourist ships that will use Herceg Novi City Port.As another part of preparations, shirts were made for City Port workers, and the plan is for City Port to purchase footwear and Bermuda shorts for them to work in during the summer.Two lockable bulletin boards were also acquired, on which price list, procedure rules in the port, as well as other useful information will be posted.A number of benches were repaired on the pier and there is a small number of new trash bins. As a preparation for season 2012, diving, electrical and plumbing works were carried out on the infrastructure in preparation for reception of yachts and tourist ships that will use Herceg Novi City Port.